A bunk bed does not have to be a boring piece of furniture taking most of your children room’s space. It can be playful, smart and good looking! 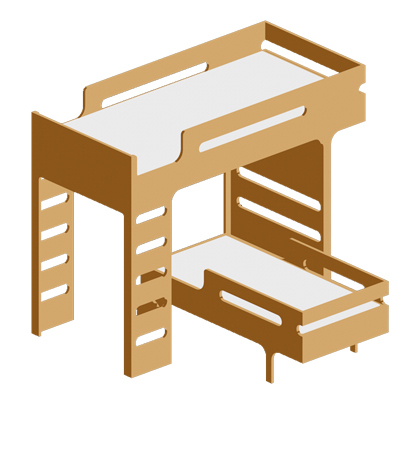 Rafa-kids R toddler bed and F bunk bed form together a great set for younger siblings sharing a room. The toddler bed with its wheels can be ROLLED AROUND in different positions. So FUN & FLEXIBLE! It is designed for children age 3+. 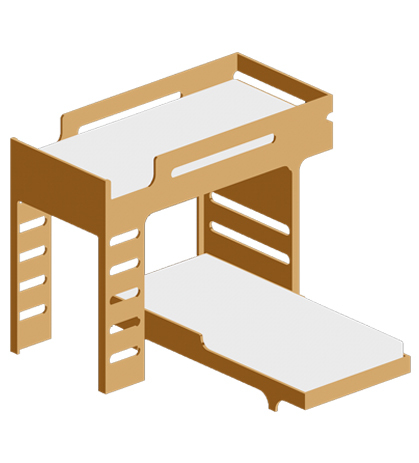 Upper F bunk bed is great for a bit older brother or sister. The toddler bed FITS PERFECTLY between the ladders and once ‘parked’ under the upper bunk the set is in it’s most COMPACT. You can roll it out a bit or set it perpendicularly so that your kids can see each other, throw cushions and wish each other a good night sleep. Both beds have safe side protections and playful shapes. F&R is a fantastic set for your young couple of troublemakers. Are you worrying that your narrow room is not big enough for two children? We had the same problem and found a perfect solution for it. The F&A75 is a compact and TIMELESS bed set for your children’s room. Both beds are 2 meters long making it usable for years to come. The A75 is narrow enough to fit perfectly between the ladders of the upper bunk. Great for teens but adaptable for younger children with our A bed rail. This set is elegant and SUPER COMPACT. Works fantastic even in the most NARROW of rooms. The power of Rafa-kids collection is that all the beds are great individually but WORK SO WELL TOGETHER too. 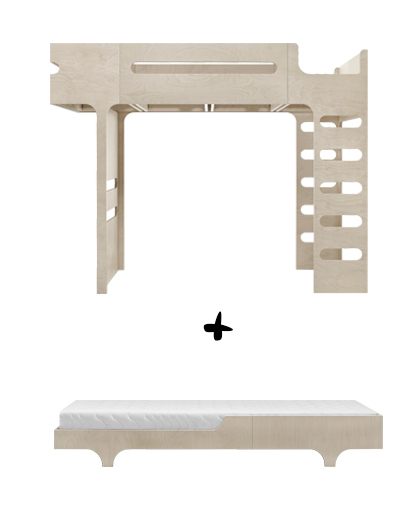 Pulling the A75 teen bed from under the upper bunk gives the set a whole another dimension. Kids can see each other. Free space under the F bunk bed can be used to play and chill. This set is an elegant and very compact solution for your young children and teens. The last set is F&A90 or F&A120 beds. The comfortable single person sized A90 or even wider A120 teen bed STILL FIT UNDER the F bunk bed, but only in the perpendicular direction. This setup is so SPACIOUS AND COMFY. 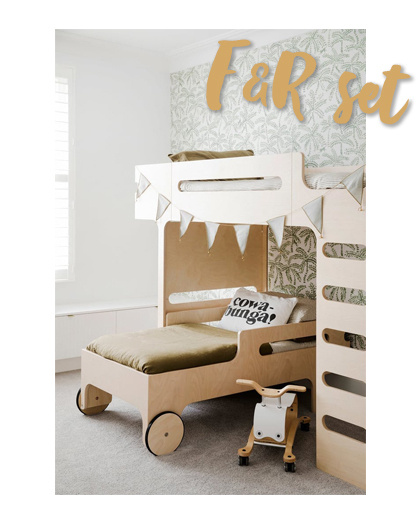 A great solution for BIGGER ROOMS where your child can enjoy sleeping on the wide teen bed and have a super cool bed for friends sleeping over for example. 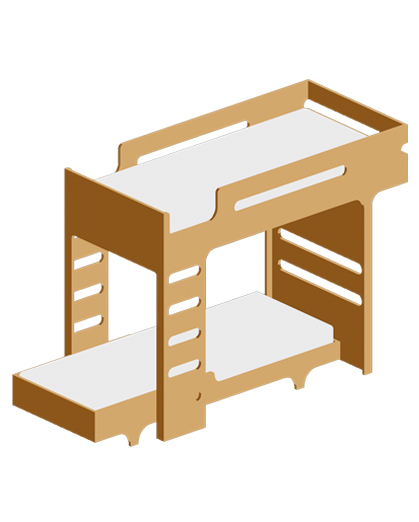 The F bunk bed with A90 or A120 teen bed form together a perfect set for teens and young adults. Because Rafa-kids beds are DESIGNED TO FIT with each other a parent can choose to have one bed first and add another one once children get older. 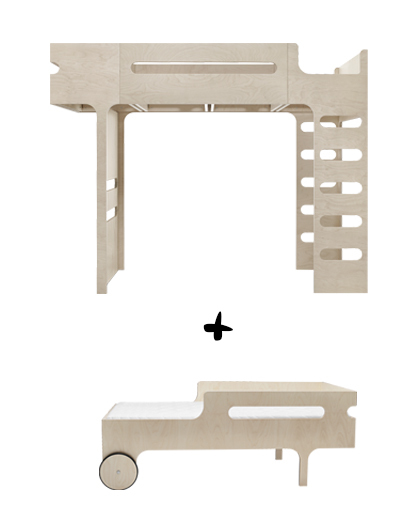 Rafa-kids beds form a smart and functional collection that can grow with your children.